”] Ryan had a poor performance in this game. It wasn’t as bad as I thought it was when I watched it live, but he still had a pretty bad game considering everything that happened. The interception he threw to Polamalu was an incredible play on Polamalu’s part because of the instincts, closing speed and just overall uncanny ability to pick the pass off and get his feet inbounds, but it wasn’t an impossible play to make. Ryan had been throwing that same ball to Roddy all game long, he probably threw it at least 10 times or more over the course of the game. The Steelers’ corners started to key on it and had blanket coverage on a number of them as the game went on, but finally Polamalu tried to jump one and he came away with a great interception. That is on Mularkey for calling such a predictable game, but it is also on Ryan for staring Roddy down on that route and for throwing to him on that same deep curl over and over for the entire game. Plus Ryan doesn’t have the arm strength to throw a deep curl to the sideline like that, so his passes hang in the air a bit which gives the defender more time to close on the ball and make a play on it. Hence why Pittsburgh’s corners and defensive backs were in Roddy’s hip pocket all game regardless of how crisp he was going in and out of his break. He had a number of bad throws in this game (I counted about seven in this game), some of which were due to bad footwork (I counted about five or so instances of this, meaning an off balance throw, throw off his back foot, etc.) and some just due to him getting flustered in the pocket and panicking. There were a few instances where he had time to throw and just missed his target, which will happen. However, we really need to stop making the deep curl and deep out such a critical route in our offense. Ryan can throw it and complete it, but if we keep doing it over and over like we did in this game teams will key on it and have some easy interceptions because of how long the ball stays in the air. He has to time the throw perfectly, throw an accurate ball and put it on the right shoulder for Roddy or anyone else to have a good chance at catching it, otherwise the defensive back will be able to knock it away if they close on it well or if they are expecting it. Mularkey really needs to work to Ryan’s strengths which involve beating blitzes, quick throws, throws over the middle and throws that require more touch and accuracy rather than pure arm strength like throws to the sideline require. We can’t scrap them from our offense entirely obviously, but there’s no reason we should be blatantly playing to one of his greatest weaknesses on such a regular basis. Ryan threw the ball 44 times in this game. That number is much higher than I would prefer, especially when our running game was as ineffective as it was. Ryan had a number of good throws in this game, I counted about seven good throws, five very good throws and fourteen solid throws overall. As you can tell, we threw the ball way more in this game than I think we would ordinarily want to. Our running game was just not effective for the majority of the game, but I will touch on that more when I break down how Turner, Snelling, Norwood and the offensive line did. However, Ryan and Roddy had a lot of pressure put on them to perform well and Ryan did a very good job of coming up with big 3rd down conversions in this game. He started out playing poorly on 3rd down at the beginning of the game which coincided with him looking very uncomfortable with his offensive line. He showed a number of examples of poor pocket poise at the beginning of the game as well as some bad footwork and bad decisions that occurred when he panicked in the face of pressure. That is definitely not something I expected to see out of Ryan so I made sure to see how he looked in those situations as the game progressed. As the game continued he definitely settled down and played better, made better decisions and showed a lot more poise. However, he was getting away with those deep curl throws to Roddy and Roddy made some very nice catches with defenders blanketed all over him which had to help Ryan’s confidence. So after he threw that interception to Polamalu his confidence took a huge hit and he resorted to his earlier antics a bit during the drive in overtime, but still looked better late than he did early in the game. Ryan definitely had a mixed bag as far as good decisions and bad decisions as well as good/very good throws and bad throws. Again, we threw the ball way more than I would normally like (44 times, which is way too high for a run-first team like us) and we were completely ineffective running the ball (25 attempts, 58 yards and only 2.3 yards per carry). We couldn’t run the ball well so we got into 2nd and 3rd and long situations far too often, and Ryan had to throw us into field goal position to get us any points what-so-ever. We had no balance and eventually we just became entirely too predictable and mistakes were made like Ryan’s interception late in the 4th quarter. Because I am writing this after the fourth game of the season I have the benefit of looking for trends, and I found some that were similar to those I identified three years ago when he came out of Boston College. When he was at Boston College he regularly had to throw the ball a lot to keep the team in games and often when he did that he would turn the ball over more often than when the team had a semblance of a running game. In the two games that we have had no running game (against Pittsburgh and San Francisco we had a combined 156 rushing yards on 54 attempts for a pathetic 2.88 yards per carry average) Ryan threw the ball 44 and 43 times, respectively. 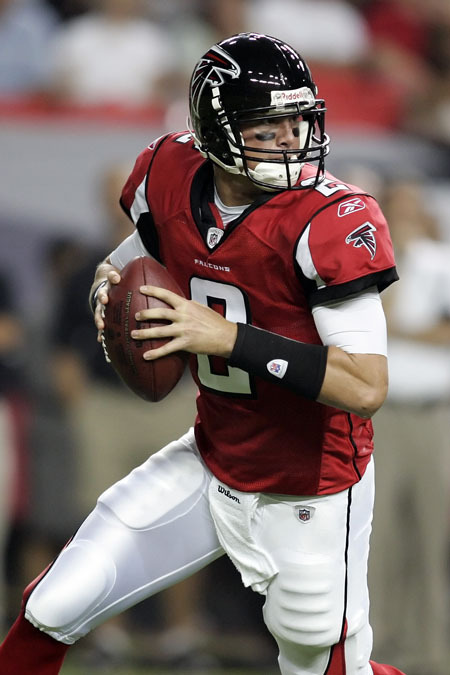 In those two games he threw three interceptions versus only one touchdown, had an average of just under six yards per attempt versus over seven yards per attempt in the two games against Arizona and New Orleans, and an average QB rating of about 67 against Pitt and San Francisco versus about 112 against Arizona and New Orleans. In this case I truly believe the stats speak for themselves: When Ryan has to carry the offense by throwing the ball 35 or 40+ times in a game, we struggle and he struggles as well. The only times we will have to do that is when we get behind early in the game or when our run game sputters, which is what happened against Pittsburgh and San Francisco. The disparity in Ryan's stats when he throws the ball more than 40 times versus 35 times or less is staggering. Now, I haven’t re-watched the past three games yet so I can’t accurately describe how Ryan played in each of them, but I can tell you right now that the dominant running game we had against Arizona and New Orleans played a significant role in Ryan being vastly more effective and efficient. He is very good off of play-action, especially when we don’t roll him out to the sideline and we just let him make his progressions naturally. However, when the running game isn’t effective and he has to do a lot of straight three and five step drops to try to throw the team into the game he is going to turn the ball over more. That is just who he is as a player. He doesn’t have the rocket arm strength or arm to put the team on his back like Peyton Manning and throw for 400 yards and pull out a win in my opinion, which I now realize means that I don’t think he will be one of the best QB’s in the NFL for his entire career. That is a bit disappointing considering the incredible hype he had after his great rookie season, but he is definitely a good enough QB to put together a crucial game-winning drive when we need it most. 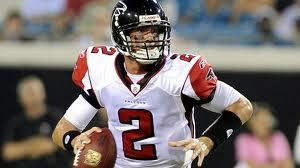 I know that because he has done that regularly during his first two and a quarter seasons on the Falcons. That means we can win a Superbowl with him if we surround him with enough talent along our offensive line to consistently run the ball and if we give him enough weapons to keep the defense off balance by spreading the ball around. We don’t have those pieces in place yet so it will be interesting to see how we go about acquiring those pieces to allow Ryan to flourish. Because if we surround him with that talent I absolutely believe he will. Overall I think Ryan had a below average game, but it was not nearly as horrible as I thought it was watching it live. The Polamalu interception was so late that it made everything seem so much worse than it was. Our offensive line really made it hard on Ryan, but he made quality throws to convert for first downs on at least eleven or twelve 2nd and 3rd downs with seven or eight yards needed to pick up a first down. Many of them were on 2nd and 10 or 3rd and 10. That had a lot to do with our ineffective running game obviously, but Ryan still stepped up to the challenge and did the best he could. He definitely missed some open targets in this game because he got too locked in on Roddy, and I saw probably three or four instances when he could have made a routine or solid throw and picked up a nice gain or a significant chunk of yardage. That will happen, but Ryan is usually much better about going through his progressions than he was in this game. It was a poor effort on his part, and that was reflected in his stats, but there was plenty of silver lining to be found in this game in the form of his number of good, accurate throws, his poise in the pocket getting consistently better throughout the course of the game, and his regular conversions in long yardage situations on 2nd and 3rd downs. 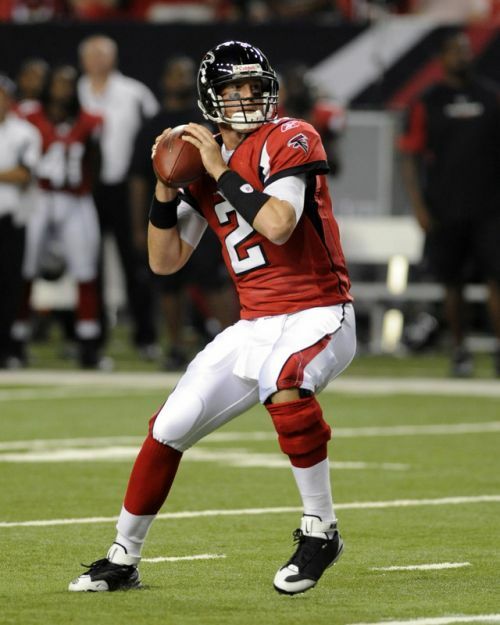 It will be interesting to break down the rest of the Falcons games this year to see how Ryan progresses as the season goes on during my careful film study of each game. Look out for more in-depth Falcons analysis! Go Falcons!! Thanks for reading, hopefully you enjoyed this piece. I will have a number of other Falcons-focused reviews coming throughout the course of the season as I get around to re-watching each of the games, taking a lot of notes on each play, and then analyzing the information I gather and summarizing it for everyone to read. I’d like to do this for more teams than just the Falcons, but I think it makes sense to start with the Falcons and perhaps try analyzing a critical game for another team every once in a while. I’m sure I will have a Vikings and Packers game analysis at one point during the season since I see them play so often and I am so familiar with their rosters.